Use this during summer months. Not too hot, and it washes and dries nicely. Bought the pale yellow and the taupe, love them both. Think I will be using them for years to come. Madison Park Mansfield Reversible Coverlet Set is the perfect coverlet to use as a layering piece or an alternative to your comforter for a new solid look. The classic stitch pattern pairs easily with your existing decor and will sure to add a new decorative element to your bedroom. The coverlet is pre-washed cotton fill and the face and the reverse of the coverlet are a super soft brushed polyester fabric. Absolutely love it! I have 2 large dogs who sleep on the bed and live in the country, so dirty paws are a way of life. The brown hides the dirt fairly well, and brushes off easily. Also, it is machine washable so I can throw it in each week. No shrinking or fading, looks fantastic even after 5 washes. Can't see any difference with the shams that haven't been washed yet. Nice weight. I have a light blanket under for colder nights but will need nothing with it for the summer. Aside from washing and staining issues I've had with other comforters that tear easily from my dogs' nails when they are rolling around foolishly. This fabric feels strong and, combined with the stitching, I don't see nails tearing through for a VERY long time. Absolutely love it! No complaints and would buy another any time. The coverlet is beautifully stitched and looks quite expensive. I like being able to wash it and that it comes out of the dryer as good as new! I bought the full/queen size and it fits perfectly on my queen bed and the pillow shams fit standard pillows, too. The coverlet is lightweight and looks like a fine quilt. I get lots of compliments on it. If you get very cold at night and need lots of covers you will love this coverlet as it holds in heat. Since it is not cotton it does not breath like cotton. Personally, I get very hot under it and would prefer cotton. My husband, who is usually cold at night even kicks off the coverlet during his sleep when he, too gets hot. I would recommend it to anyone who lives in a cold room. But if your house is comfortable you will get too hot. I purchased this for someone with a twin bed. As I wanted the coverlet to reach the floor on the end and the sides of the bed , I purchased the double/queen. It was about six inches to long on one side so I did have to alter it but I believe the twin would have been too short. The coverlet is a beautiful soft blue quilted fabric and well made. I ordered this in King/Yellow, and then was dismayed by the negative comments about size and/or color. Not to fear. I received this and it is not shiny like discount store bedding, and it is NOT neon overly bright yellow as reported in some of the reviews. It is a soft butter yellow and buttery soft almost like microfiber, the quilt and shams look like they cost 5X what I paid for them. As for size, I have a split Eastern King Sleep Number Flex Fit Plus adjustable bed with 15" Pillow Top mattress and it is overly large for almost any bedding I buy. However, the quilt covers the bed, all of the top mattress and over the top of the bed skirt all the way around, and has enough length that I wouldn't need the shams were it not for all the pillows we use. It is very soft to the touch and I am certain will only become softer with each washing. I have 3 cats that share the bed, and the don't seem to be able to inflict any damage with their claws. This is my first purchase from Overstock as well as of Madison Park brand bedding and I am more than pleased with the quality and savings. 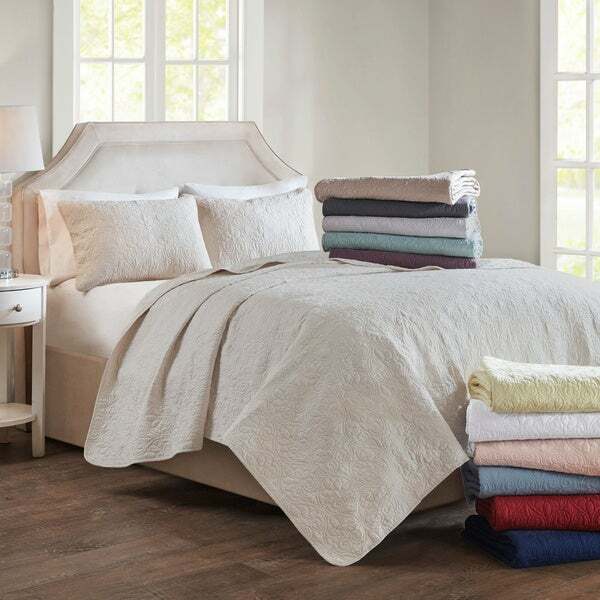 I will be ordering another Madison Park Mansfield Coverlet Set as soon as I can decide which color next. Have already received numerous compliments from family, friends and neighbors and have recommended Overstock and Mansfield to all and sundry. Way to go Overstock. Thank you. This coverlet is 90/10 cotton/ polyester.. But is feels like all cotton. It' a true ivory in color and it is very soft and the quilting on the coverlet gets a little puffy as you use and move it around. Which makes it even more beautiful. This 3 piece coverlet set is a bit oversized. I have a queen bed and a feather bed on top, and when the coverlet is on the bed it hits 1 inch below the bottom of my mattress, just covering the top my box springs by a hair. It is perfect for me . But, of course if you wanted more coverage on one side for daytime beauty you could always pull to one side a little more. Anyway, it's EXACTALLY WHAT I WANTED AND IT IS EXACTLY WHAT IT LOOKSLIKE IN THE PICTURE. BEEEEEAAAAUUTTTIIIFFFFUUULLL..Thanks overstock for carrying such a beautiful product at such an affordable price. Oh , one last thing. Mine has washed up like a dream, just make sure to use slightly warm or cold water and just toss in the dryer on gentle for just a few minutes. Thanks, I hope that I covered everything, so I could be of some help to another shopper. I bought this because the price was right. It fit what I was looking for. It is thin, so it is good as a stand alone blanket or a topper to put over comforter. I like the design that is stiched it to it giving the quilt look. The picture and the description of it being Microfiber--made me think it might be thick, plush, and too hot...but I took a gamble on it based on the customer reviews that it was thin. It is 90% cotton and 10% polyester---it is easy care, wash and dry. I was glad when it came it was what I wanted. I wanted a thin, solid neutral colored quilt like blanket and that is what I got. I am happy the price was not outragous, well below $100 was the right price for me. Nice quality quilted pattern coverlet. The pattern is also very rich looking. I chose the color Khaki and I have some black throw pillows that really gives it some pop. The quilt is light enough in the summer with just a bed sheet and no blanket. The Coverlet also is an inch above the wood floors in my bedroom. I plan on ordering another one as I have one other twin in the bedroom. I just love this coverlet which we just bought from Overstock. It is beautifully made and not heavy as with comforters. The color is true as seen online. We have a queen-sized bed, however, we purchased the king-size coverlet. We have a pillow top queen mattress, and our box springs are 9 inches deep. We don't have a footboard. The king JUST covers the box springs. My dilemma is having the king-sized shams. Too large and overwhelming for the bed. How would I find matching full/queen size shams for this bedding WITHOUT purchasing another coverlet in queen size? Love everything about it. The weight is good. Covers my queen bed good and I even have 3 inch topper. Very pleased. Very happy with size, weight, and color of coverlet and shams. Fits bed nicely; not skimpy at all. I consider this item to be an excellent value for the price. Would definitely recommend. I ordered this to help keep cat hair off my actual duvet and it is awesome! Easy to wash and care for. Inexpensive but does not look cheap. Color is great. Light weight. It was exactly what I needed to throw over my bed! I'm a bedding snob, and really picky about quality, so I was pleasantly surprised by the fit and fabric of this bed spread. It is generously sized in the King, and fits really well. It does not come to the floor, like many bed spreads, but hangs about 4-5" below an extra deep mattress. This was perfect for me since I used it w a custom made bed skirt that I wanted exposed. It also solved my standard problem, of bedding that is too small, even when purchased in a King. I can't stand king bedding that isn't wide enough to cover the mattress completely on both sides- and this is often the case even with the most expensive makers. The fabric is really soft and has an egg shell sheen- perfect for pairing with linen. The shams are well made too, and have a center insert opening on the back, verses the cheap side design (which never fits or closes quite right over a pillow). I have had tons of complements on this spread- and can't say enough good thing about it! Machine washable too! I received this coverlet within 2 days of ordering it. It was just a pictured. I ordered the khaki color. The color was on the lighter side of khaki. The fabric was not shiny. It dressed up my bedroom without being fussy. I have a queen size bed, but I ordered the King size as I wanted the coverlet to drape over the end and sides of my bed, which it did. This coverlet is a true value. I shopped around and found items similar for a lot more money. I dont like things that are to matching so I added different pillow shams and a different colored throw at the end of the bed. It looks cozy and inviting. The picture does not appear like the actual product. The actual product is a slick shiny material and reminded me of a padding you would put down to protect a baby when you are changing him. At first I thought I could make myself like it but the more I looked at it I said; no, this has to go back. We ordered this coverlet set in Seafoam for our master bedroom. Based on the reviews, I was worried that the full/queen would be too small, especially since we have a large pillowtop mattress with a foam topper. However, the blanket fit perfectly. The color is also perfect--I was looking for the dusty blue-green that is popular but usually costs much more, and this is exactly the color I was looking for. The picture does make it look much plusher, but because it is a coverlet, I knew to expect something thin. We are using it over a white down-alternative comforter, which adds some volume to the overall look. Despite being thin though, it is VERY warm, even in our old drafty house. The stitching is beautiful, with very few loose threads, and is just another aspect of the coverlet that makes it look so much more expensive than what we paid. Definitely recommend! I purchased this set for a king-size bed. The bedroom features some antique furniture, and this was the perfect understated look that I wanted for the room. I purchased the ivory color, and it is warm and lovely. It washes like a dream. It's not long. I may get a bedskirt, as my bed is a little higher than normal. This coverlet is beautiful and versitile!! I use this in several of my guest rooms! This can be decorated for any holiday! Love it! Highly recommend!! Bought this in the navy, very good quality, will be purchasing in other colors. Loved the quality of this coverlet. This coverlet is very light, perfect for Florida nights or summer nights anywhere. It fits our king bed nicely and makes the room look light and airy. Yes, I would recommend to a friend. Love it so much! The size of my queen bed is perfect and the material is soft too. Just love it! Not as nice as I expected but is warm (not too warm) and comfortable. Pilling was an issue. "What bed skirt would you recommend to match the gray quilt?" "The description is a little confusing to me. Are the pillow shams both the same size ?" yes, the queen and king sizes both come with 2 same-sized shams, the twin size only has one sham. Yes, I ordered the king and it came with two king size shams. The King size Shams are both the same size. "What is the thread count on these sheets set? Also is the quilt and Shams washable, or dry clean?" Not sure of the thread count - the quilt is thick and I have washed this several times in my washing machine and color has not faded. Yes, the quilt and shams are washable! "Is there an option to order additional shams?" The designer does not have shams on site, all part of sets. We cannot sell parts of sets. "What does SEAFOM mean "
Seafoam is a cross between a blue and green. Not a sage which has gray in it but blue/green almost a lighter version of a teal and not as deep. The color can be hard to describe but think of Bermuda waters...not all blue but the area that has green. I agree. I love it. It matches the decor I chose perfectly. Seafoam is referring to seafoam green or a light aqua (blue green) color. "What shade of blue? Looking for a slate blue." The blue is a Royal Blue. slate blue to me means sort of a grey-blue. This is a light, soft blue, but not so grey. "Is the yellow a true yellow or a greenish yellow. The picture looks more greenish yellow. Thank you." Yes, it is a soft yellow. Very nice, actually and it washes up well.